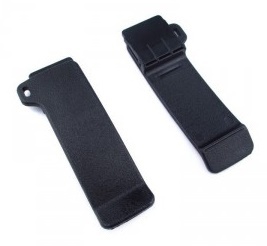 Belt Clip for ICOM-style battery packs such as BP-194, BP-195, BP-196, BP-197, BP-197h, BP-199, BP-200L an others. Slides into bracket on back of battery. $ 3.00 pricing is for 1 belt clip. BC-272C: Belt Clip for ICOM BP-272Li, BP-271Li, BP-273. Heavy duty spring loaded belt clip; fits ICOM brand and our brand BP-272, BP-271, BP-273 products.